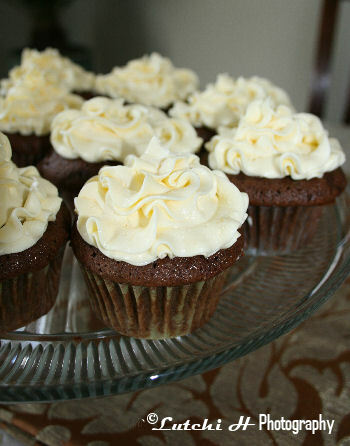 The kid’s enjoyed these easy to prepare and delicious chocolate cupcakes. 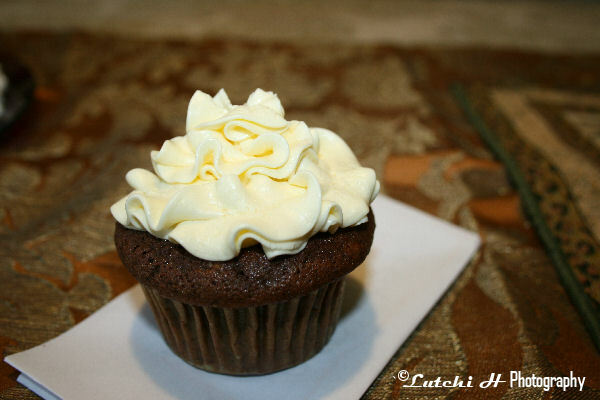 I used the left-over butter cream for frosting that I have made during Zack’s birthday two weeks ago. Hey! If you have the money to spare then grab the finest cocoa powder you can find. One of the secrets of the melt in your mouth chocolate cupcakes is a good quality coco powder (that based on my experience). I have tried the cheapest or store brand coco powders and they can’t compare and I guess you all know the reasons why. Valrhona Cocoa powder, Hershey’s Cocoa powder, Hershey’s Special Dark Cocoa, Ghirardelli unsweetened Cocoa. 1. Pre-heat oven to 350 degrees F. Line cupcake pans with paper liners. Set aside. 2. In a medium bowl, beat the butter until soft. 3. Add sugar, beat about 3 minutes. 4. Add the eggs, one at a time beating until they are well combined. 5. In another bowl, place all dry ingredients. Stir until combined. 6. Add ½ of the dry ingredients to the butter, sugar, eggs mixtures. Beat it just to combine. 8. Add the rest of dry ingredients. Beat until combined. 9. Divide batter evenly among liners, filling about 2/3’s full. 10. Bake for about 20 minutes or when toothpick inserted comes out clean. 11. Transfer to a wire rack to cool completely. 12. And frost the top of each cupcake with your favorite frosting. You can add sprinkles or nuts or fruits, if desired. 0 Comments On "Chocolate Cupcakes with Buttercream Frosting"